When fans get comfortable on their couches on a Friday night to watch their favorite team, the graphics flying across the screen are a major aspect of the production value. Although the networks deploy the packages that educate and entertain viewers, the process truly starts with the vendors. 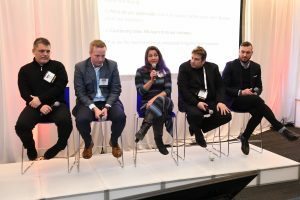 At the recent SVG Sports Graphics Forum, third-party studios and broadcasters discussed the finer details of what it’s like to develop a product within a push-pull relationship. With any project, it’s always easier to work alongside someone you know. The same applies to the inception, construction, and execution of a graphics package for live sports production. When it comes to getting a job done correctly, a partnership that entails respect and relatability can increase the likelihood of success. From left: drive studio’s Nick DiNapoli, MSG Networks’ Jason Joly, Undefined Creative’s Maria Rapetskaya, ESPN’s Michael “Spike” Szykowny, and Houston Media Group’s Christian Winters discuss the back-and-forth of creative collaboration at the SVG Sports Graphics Forum. On a larger scale, companies with nationwide reputations and a long lineage of star power can potentially stunt the growth of a business relationship. In this type of back-and-forth process between two entities, elements can get lost in translation. For any team entrenched in the work, sticking to a comprehensive and efficient workflow is the hardest task to complete. On the studio side, designating a go-to individual to relay the progress of a community project can be a simple solution to guaranteeing clear communications. After appointing a person for representation, vendors urge setting deadlines and sticking to a plan without deviating too much. On a team that stays true to an agenda by maintaining timely work, there isn’t any room to sacrifice quality. Despite scheduling strict deadlines for the studio team, Maria Rapetskaya, founder/creative director, Undefined Creative, prioritizes accommodating the culture and mindset of those who work on the broadcast side of the operation. Ultimately, a business partnership that involves an open mind to curate a productive idea and an open line of discussion will provide mutual success for both parties. Check www.sportsvideo.org for in-depth reports, video interviews, full-panel audio recordings, photos, and more from the Sports Graphics Forum.